The Government will transform Mangere with an ambitious programme to build 10,000 new homes for families from all walks of life, Minister of Housing and Urban Development Phil Twyford has announced. Minister Phil Twyford today opened the Mangere Development Information Centre and visited the first lot of old state houses being replaced with a combination of new state houses, KiwiBuild and affordable homes, and market homes. “Located near the route of the coming light rail line, the Mangere redevelopment is an example of the opportunities opened up by the creation of this new rapid transport network for Auckland. “The redevelopment will include up to 3,500 affordable KiwiBuild homes for first home buyers. Phil Twyford said signing off on the business case for the Mangere redevelopment was one of the first things he did as Minister. “Now consultation with affected families has been undertaken, we can lay out the plans publicly. “Over a period of 10-15 years, 2,700 worn-out state houses will be replaced by 10,000 new homes. This will comprise approximately 3,000 new state houses, 3,500 new KiwiBuild and affordable homes, and 3,500 market homes. This is 3,000 more homes than the initial plan put to me when the Government came to office. “Stage 1a of the redevelopment is underway. Thirty-five state houses are being demolished to be replaced by 66 more state houses and 100 other homes, at least half of which will be KiwiBuild and affordable. “Building of the first new state houses will start in the next few months and are due to be finished mid-2019. 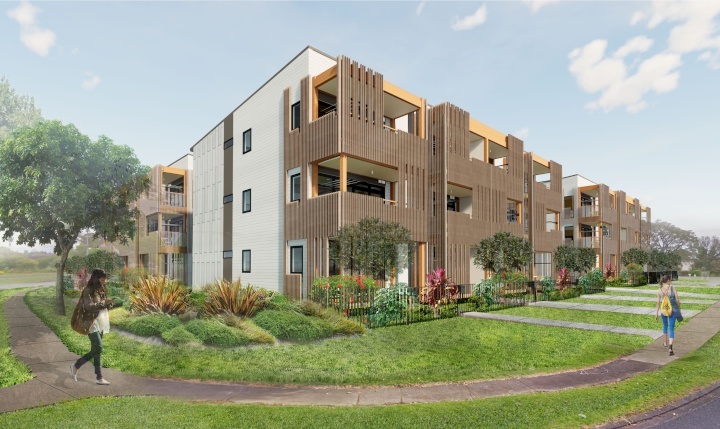 The first KiwiBuild and affordable homes will be complete towards the end of 2019 and early 2020. “I am determined that the local community benefits from this re-development and are not priced out of the new homes. HLC are working to keep the prices of KiwiBuild homes as low as possible. Prices and exact numbers will be finalised as building contracts are agreed. Long-term rent and shared equity options are also under development. “Building up to 3,500 KiwiBuild homes in Mangere will give local families a realistic shot at homeownership. Homeownership helps families put down roots in their community and provides stability for children. “With new homes for families and access to light rail, this is going to be a great outcome for the Mangere community,” says Phil Twyford.